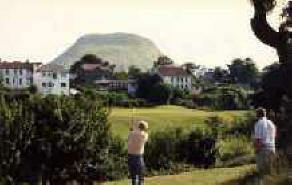 Cushendall Golf Course is located on the outskirts of Cushendall beside the sea. This gives the course a wonderful varied outlook, from the sea on one side to the Lurig Mountains on the other. Looming particularly close is Garron Point Mountain. On a clear day you can see across the Irish Sea to the Mull of Kintyre. The course is a 9 hole mixture of parkland and links giving it an interesting layout. It is an easy walking course with only some small rolling bumps. The 9th hole is the locals favourite and is probably the most difficult. The green is difficult to hit because of the river. The 4th is another pretty hole that runs beside the river. This is another hole that is difficult to fashion a score on.